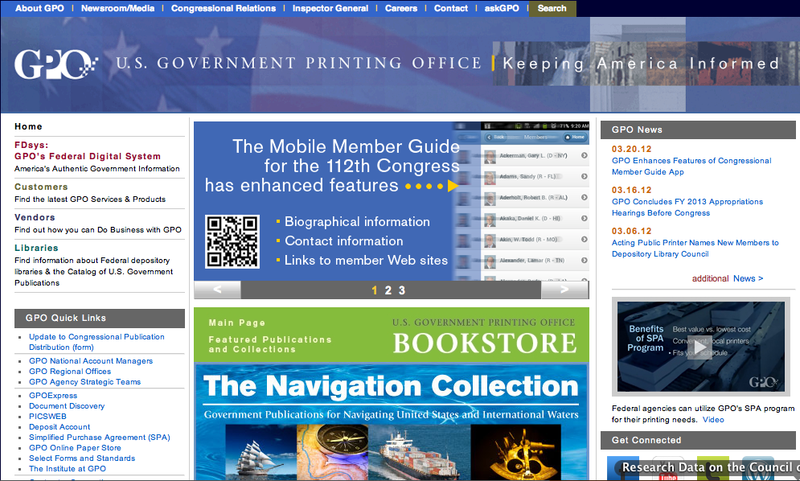 The website of the U.S. Government Printing Office (GPO) is the digital version of the governmental agencies entrusted with the task of informing American citizens about federal administration’s activity, since 1813. The GPO web-publication activities date back to 1993, when it started gathering, indexing and storing all public official documents produced by the federal administration, also making them available on-line for free. Most of the material goes back to 1994, even if many previous documents are digitized and published. Topics cover virtually all Government’s activity areas, including planning documents, reports, working papers, federal bulletins, bills? history, governmental commissions? members, public presidential speeches. GPO website also acts as a tool to access other federal official archives and is completely free: neither membership nor subscription is needed to view and download the more than 275.000 available files. Data are published in full-text version and downloadable as such, both in pdf high-quality image and text, or in ASCII. Its web architecture presents detailed general downloadable help guides; tips to aid navigation are provided alongside with each searching tool and data retrieval engine.